dominic gave it to me and i dont think he wants it back. all the work i've put into it ... he aint gettin it back anyway. i put a new high mass bridge on it and a dimarzio split p.
i'm gonna strip it and give it some paint (currently its all chipping away). i got an associate who can spray dyes and has multi directional two tone paint. no trem on this one guys ... sorry ... no room. i gotta figure out what i'm gonna do with the neck ... this is the one the truss rattles on. i'm gonna start by simply just re-hydrating it. next would be to try that wood swell chemical. if that doesnt work, i might just dump some tool handle rubber down there. the action and playability has always been fine (not the best ... cheap bass) so if i get it set and lock it in ... no biggie. i'll be the only one who has one that i'de ever seen. i figured i'de drop the xlpc right under the bridge at the top of the cavity. i havent decided to run it on its own 1/4 jack or to have it switch bass on, theremin off / bass off, theremin on. 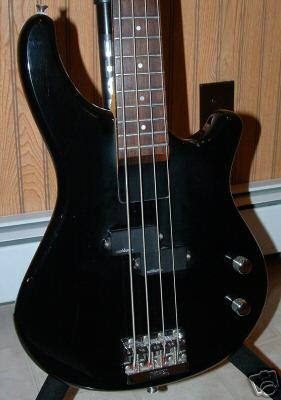 i'm open for other suggestions as to cool stuff to do with this bass. That looks like a cool project! I'm intrigued by the theremin idea. If you can, I'd be interested in hearing some sound clips after you install it. And a Kahler wouldn't fit, but a Hipshot would. Just a thought.